Archbishop O’Donnell researched and documented his family history. His grandmother, Sarah Sheehan nee Fanning, was the sister of William Patrick Fanning who emigrated to Victoria in 1841. In a letter he wrote to his nephew in the U.S he outlines his family history. I am very grateful for the family news you gave me at Xmas and I have entered your grandchildren in the Family Tree. They are the seventh generation from my great-grandfather James O’Donnell (1757-1810) and Amy Elizabeth is the seventh generation of the name O’Donnell. I have three large charts containing respectively the Pedigree of the O’Donnells of Knockinglass, the Skehans and the Creans. They were compiled by our cousin Father Walter Skehan (RIP). He was a first class historian and he got his information from various family records, parish registers, tombstone inscriptions, old government documents etc. etc. Copies of these three Pedigrees are with John Skehan (farmer) of Clonbrogan, Fethard, Co. Tipp. (Father Walter’s brother), with the Diocesan Archives, Archbishop’s House, Thurles, with the Irish Genealogical Office, Dublin. They contain hundreds and hundreds of names. You can imagine this when you reflect that my great-grandfather had eight children (2 sons, 6 daughters) and they had 82 children. Imagine their descendants! So, you may see how impossible it is for me to send you these charts to inspect. You can understand how I would not let them out of me possession for a moment. I compiled excerpts for you and a table which shows your own direct descent from James O’Donnell (1757-1810) and as far as your grandchildren. If any of the other members of the O’Donnell clan in the USA are interested, what I am sending you will be sufficient for you to compile a genealogy for them. I have a notebook which my father kept in which he entered the dates of his own parents’ deaths, of the date of birth of his own sixteen children living and dead, of the dates of your father’s and your uncles’ Joe and Ned going to business in Dublin and the dates of their departure for the USA, of their marriages and deaths. I cannot lay my hands on the notebook at the moment. The last time I saw it was about 3 months ago but I put it away so carefully that I cannot find it now. But I will find it some day. Your sister Kitty is now a grandmother. Her grandchildren would also be seventh generation. I want the name of the wife of your some Thomas, the Christian name of Gracie’s husband and their dates of birth of your children and grandchildren, and any other information about the family that you can. There are several families of O’Donnells in County Tipperary viz. O’Donnells of Seskin, O’Donnells of Cleragh, O’Donnells of Poulmucka, O’Donnells of Knockinglass etc. etc. There is a tradition that those around the south and east of the county came from the west of the county and perhaps (and very likely) they all had their origin from a few or maybe one family that came from Tyrconnell (Donegal) some centuries ago. One theory is that the O’Donnells of County Tipperary come from one Turlough O’Donnell, called Turlough of the Wines who came from Tyrconnell. If there is anything you want explained or something you do not understand in the lists I have sent you, ask me. I am enjoying good health at 81, thank God. I have no duties to perform so I read a great deal. I loved my stay in Ireland last year. They seem to be all well there. Your Aunt Cis is getting on for 86 and keeps good health. She has lost the sight of one eye – a glaucoma; still she does quite a lost (sic) of crochet work and goes frequently to Dublin, Cork etc. and for Sunday drives with the girls. Give all my love and every blessing to Grace and all the family. Your devoted Uncle, PS I am sending the Family Tree list under separate cover by this mail. Some genealogical notes by Archbishop O’Donnell for the information of his nephew Jack O’Donnell of New York USA. O’Donnell’s of Knockinglass (near Moyglass) County Tipperary, Ireland. James O’Donnell born 1757, died 1810, married Catherine Crihane (now pronounced and written Crean). There is, so far a lack of documentary evidence as to the immediate ancestors of James O’Donnell but tradition has it that his family and other O’Donnell families came from the west of the county and are a branch of the great clan O’Donnell of Tyrconnell (Donegal) which played a noted part (with the nearby O’Niells) in the history of Ireland. Catherine Crihane (Crean) was most probably the daughter of James Crean of Knockelly, Fethard. The evidence for this is very strong. If this is so, she is the grand-daughter of John Crean who is the retinue of Sir John Everard of Fethard, who fought on the Irish Catholic side against the English at the Battle of Aughrim in 1690. The Irish were defeated in the battle. Sir John Everard was killed, but John Crean returned safely to Knockelly. This John Crean was the grandson of Thomas Crean, who was living in 1666. That is as far back as we can go, mainly through the lack of documentation due to the Anglo-Irish wars and destructions about that time and earlier. James O’Donnell lived in Knockinglass and is buried in the churchyard at Rathcool near Fethard which is the traditional burial ground of the family. James O’Donnell and Catherine Crihane (Crean) are the great-grandparents of Archbishop O’Donnell of Brisbane, Australia, and of his late brothers John (Jack), Joseph and Edward (Ned) of New York, USA. James O’Donnell and Catherine Crihane had two sons and six daughters. The sons were James (Whom we call James II to distinguish him from his father) and John. The six daughters became Mrs. Nolan, Mrs. Skehan, Mrs. O’Connell, Mrs. Fitzgerald, Mrs. Slattery and Mrs. Cunningham. These eight children had families averaging about ten in each family. It is a tradition amongst the families that eighty-two first cousins attended Sunday Mass in the parish church at Moyglass and that at Christmastime, they used to make mutual visits of friendship and goodwill. My father, Thomas O’Donnell of Fethard was one of these first-cousins. I remember meeting a few others when I was a boy. James II was born 1810. It was the year his father died. When James grew up, he acquired a farm of his own at Rathduff near Moyglass and three miles from Fethard. He married Ellen O’Sullivan both lived to be about ninety. They were my grandparents. I remember my grandmother, Ellen, but I do not remember my grandfather because he died before I was born or when I was a baby. My other brothers would have remembered him, especially your father Jack who lived at Rathduff as a boy, possibly because farm life was good for his health or because his relatives at Rathduff were dotingly fond of him, which I thin, was very true. James and Ellen could speak the Irish language. My brother Jim told me that when they were very old and unable to attend Sunday Mass at Moyglass they used to kneel in their own kitchen at Mass time and say their prayers aloud in Irish. Ellen, my grandmother was a girl of 14 when Catholic Emancipation brought an end to the Penal Laws in Ireland in 1829. At that time, she would have heard her parents and others speak and reminisce about the rebellion of 1798. Of Robert Emmett, Wolfe Tone, Lord Edward Fitzgerald and Father Murphy of Wexford. She would have well remembered the terrible famine of 1847, the Rising of 1848 and the Fenians of 1867, etc. etc. She must have had wonderful memories but I was too young to have any sense of history and did not question her. James II and his wife Ellen had a family as follows:-John, James, Kate, Maria, Michael , Patrick, Thomas, Ellen. John married. His wife died soon afterwards and he returned to Rathduff where he lived with his sister Kate and his brother Patrick (both unmarried). Kate died in 1917; John and Patrick died in 1923. James married in Albany USA where he died in 1890. He had a son James and possibly more children. 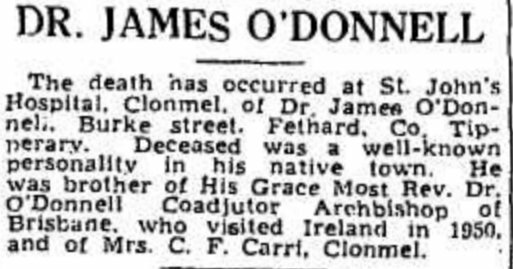 James had a son, a lawyer (who was therefore a grandson of James who was born at Rathduff). James (the grandfather) lived at 448 1st Street, Albany. I have lost touch with them. Maria married a James Morrissey of Manchester, England and had about six in family. I have lost touch with them. Michael went to Australia and married a Scotch lady named Miller. They had two sons, Bobby and Eric. Michael went goldmining at Charters Towers in North Queensland. He got some gold but the reef at which he was working fell on him and he was brought to his hotel which was run by his cousin Lena Fitzgerald (Mrs. Rodgers). Lena afterwards came to live in Brisbane and told me about Michael. He lived some days and made a will providing for his two boys. The Rodgers were the executors. When the boys came of age they came to claim their legacies from the Rodgers as they wanted to buy a sugar plantation. The Rodgers have not heard of them since. As Michael died in 1897 these two boys (my first cousins) would be older than I. They or their families must be somewhere in this state of Queensland but so far I have not traced them. Somewhere in North Queensland, I should think, in the sugar industry. Ellen went to Albany and married John M. Bennis. They had two daughters who became Mrs. Porter and Mrs. W. T. Bennis who was a member of the Legislative Committee of American Federation of Labour and lived at 282 Whitehall Rd. Albany. Mrs. Porter has children and grandchildren. Her sister had one girl who died young. Possibly there are more but I have lost touch. Thomas was my father. He was born in 1856 and died in 1924. He learned the drapery business with the firm of John Ryan Laffan in Thurles, County Tipperary. In 1880 he married Johanna Sheehan of Thurles. She was the daughter of John Sheehan (1815-1881) and his wife Sally (Sarah) Fanning (1816-1888). Sally was the grand-daughter of William Fanning of Lisaroon who was born in 1731. 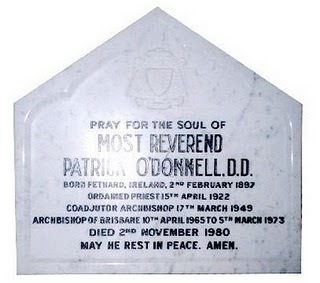 He is buried in the family burial ground at Ballycahill near Thurles. Thomas O’Donnell and his wife Johanna opened a drapery business at Fethard in 1880 and combined it with some farming activity. They had sixteen children most of whom died in infancy. Seven of those children lived. I was born in 1897. I was the youngest of the sixteen. I am now 81. My father died in 1924. My mother died in 1932. She was, I think, a year or two older than my father. She was about 78 when she died. 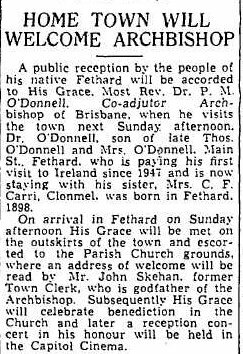 My father is buried at Rathcool with his O’Donnell ancestors; my mother is buried with the Sheehans in Thurles. The surviving children of Thomas and Johanna were: Mary Ellen (1881-1916) married James Ryan (D 1922). They left two surviving children. Thomas married Mary Walsh. They have children and grandchildren. Mary (Miriam) a Colonel in the Medical Corps, British Army, married Frank McKay. No issue. John (Jack) your father (1882-1937) married in USA Bridget Murtagh. They had children Thomas (dec’d), Kitty, Mary E. and Jack. All married. All have children and some have grandchildren. Thomas Joseph (Joe) (1884-1932) married Elizabeth O’Malley in USA. Surviving children are Mary Elizabeth, Eileen married M. Akin. They have children, possibly grandchildren, Alice married Walter Shea. James (died 1954) unmarried. Stayed in Fethard. Edward (Ned) married Hannah Cahill in USA. Died in 1932. One surviving son, Thomas who is married with a family. 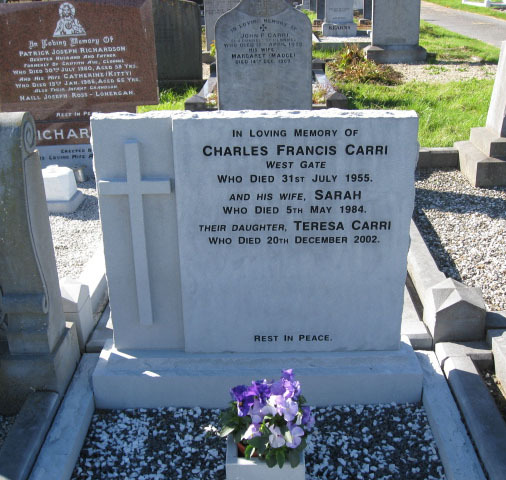 Sarah (Cis) born 1892 married Charles Carri (now deceased) and lives at Clonmel. Has a son Charles who is married with children and two single daughters, Mary and Teresa. Patrick Mary born 2 Feb 1897. Studied for the priesthood at Mungret College (Jesuit) 1912-1918. Studied Theology at the Urban College and the University of Propaganda Fide, Rome 1918-1922. Ordained a priest on 15 April 1922 by Cardinal Pompili (the Pope’s Vicar General). Went to the Diocese of Sale in Victoria, Australia, 1922. Became Vicar-General of that Diocese and Domestic Prelate to the Pope with the title of Monsignor. 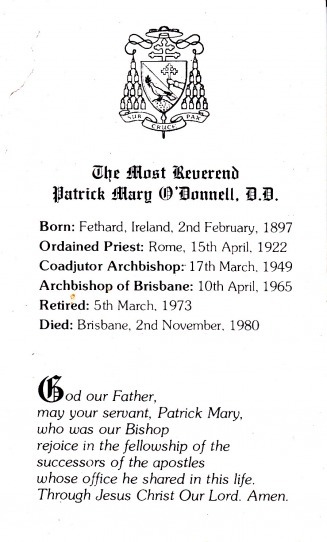 Was consecrated Coadjutor-Archbishop of Brisbane with the right of succession to the See on 17th March 1949. 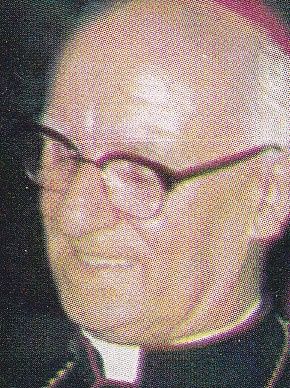 Became Archbishop of Brisbane on 10 April 1965. Retired because of advanced age on 5th March 1973. So far for the O’Donnells. My mother’s maiden name was Johanna Sheehan. The Sheehans were an old clan near Thurles and are now extinct. Sheehan in the Irish language means Peace and if you look at my Episcopal Coat of Arms above you will see that it is composed of the O’Donnell shield (the hand holding the cross) and the Sheehan shield (the dove of peace). My motto is Sub Cruce Pax (Peace under the Cross). My mother’s mother was Sally (Sarah) Fanning who married John Sheehan. She was a direct descendant of William Fanning and his wife Sarah Ryan. William was born in 1731 at Lisaroon, a prosperous farm near Thurles. It is still in possession of a direct descendant of William but of a different name. The Fannings were a numerous family. They were mostly farmers but some went into business or the professions. Three Fanning brothers who were my mother’s second-cousins went into the Vintner business in Dublin. They were Patrick, Michael and Joseph. Each had his own business. Your father, Jack, learned the business from Patrick and became his foreman. Your uncles Joe and Ned learned the business at Michael’s. Michael became a Senator in the Irish Parliament. He married his cousin, a Miss Ryan of Thurles. She was a direct descendant of the above William Fanning. Your uncle Joe married her sister Cis; it was his second marriage and her third. Several descendants of William Fanning (b 1731) intermarried. My mother, Johanna Sheehan had three sisters, Sarah died young, Ellen who married Tom Fanning and Mary who married Patrick Hogan. Mary’s daughters Josephine and Minnie married respectively Ned Fanning and John Fanning. Ned, Tom, John, Michael, Patrick and Joe Fanning were brothers. The old O’Donnell farm at Knockinglass is still owned by a direct descendant of the first James O’Donnell. He is Michael O’Sullivan whose mother was an O’Donnell. Michael lives on a nearby farm as the old Knockinglass homestead is now a ruin. 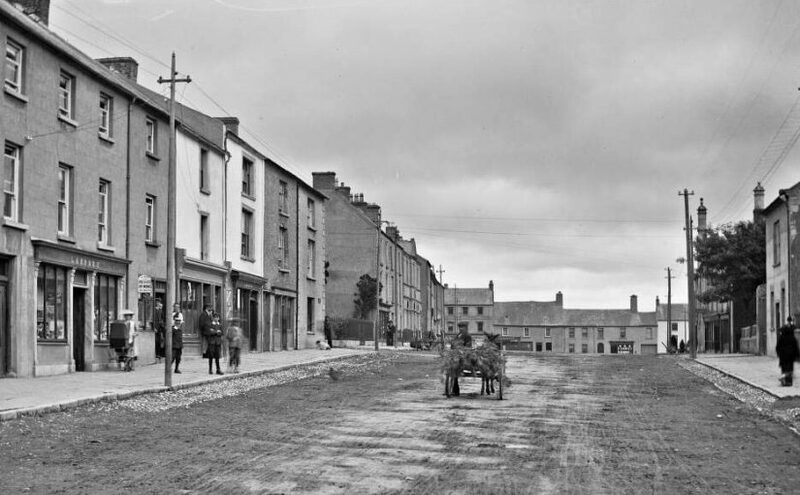 The house where your father and all of Thomas’s family were born still stands in the centre of Main St. Fethard. 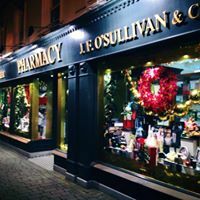 It is a three storey building and is now the business premises and family home of a chemist. One year, when I was on vacation in Ireland, I met an elderly relative Tess Fitzgerald. She remembers my grandfather James II. She told me that on the night he died the Banshee was heard keening round his farms at Rathduff and Coolenure. I told her I never heard of a Banshee keening for any member of our family. She said it was because James II was the seventh generation of the O’Donnells at Knockinglass. Whatever about the Banshee it is clear that there was a tradition amongst the neighbours that James II was the seventh generation. These people kept their oral traditions and genealogies very carefully. If this be true there would have been about five O’Donnells in Knockinglass prior to James I who married Catherine Crean. So far for tradition but it would be difficult now to establish documentary evidence. Up to about 1950 Fr. Skehan had traced upwards of seventy direct descendants of James I who were in religion (some thirty priests and the rest brothers and nuns). Some amongst the clergy were myself; Monsignor Nolan, Pastor of Tipperary and Vicar-General; his brother Fr. Tom Nolan; Father Tom O’Donnell first Catholic priest in the Isle of Wight since the Reformation; Father Walter Skehan; Monsignor Skehan of Liverpool; Fr. Paul Skehan of USA who became Procurator-General (second in command) of the Dominican Order; his brother who was a professor of Civil Law at Rhode Island College; Fr. O’Connell; Fr. Fitzgerald; several Fathers Hanrahan etc. etc. The O’Donnell Pedigree from James (1757-1810) to Amy Elizabeth O’Donnell USA is documented. 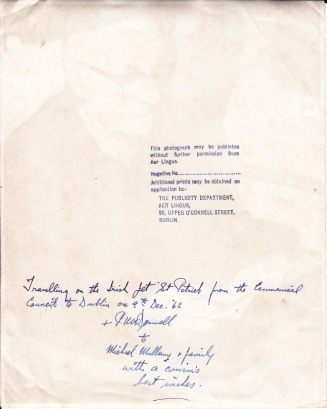 Another family connection to Archbishop O’Donnell comes through Michael Mullany son of Bridget Mullany nee Fanning. Michael was the Archbishop’s second cousin. 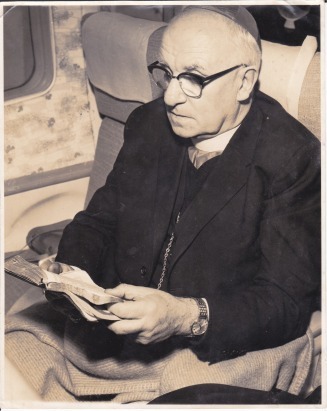 Archbishop O’Donnel on his way to Dublin 1962 wishing the Mullanys all the best. 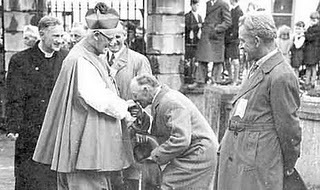 The death Of Archbishop O’Donnell was reported in the irish Examiner in four editions. James O’Donnell, brother of Archbishop Patrick O’Donnell. 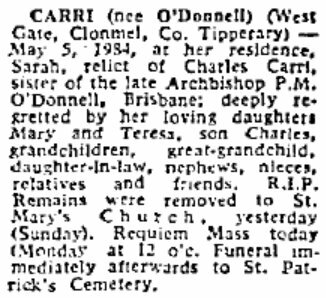 Death notice in the Irish Examiner 19 Apr 1954.